Hi! I’m the founder of KartFab.com. I’m here to share my knowledge of go karts. 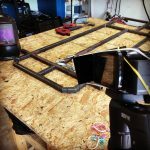 I produce sick videos of my go kart builds, restorations, and go kart maintenance tips and tricks. I also post extra pictures and inside stuff only on my social media so go ahead and follow me above. As a child I always wanted a go kart, so my dad helped me build a wooden one from scratch! I never was able to put an engine on it (wood and engines really aren’t meant for each other). I then acquired an old ‘Tote-Gote’ mini bike and drove it until the bearings failed. Fast forward a few decades, with the added professional experience in welding and fabrication, I built up my own hobby flipping go karts (or obsession as my wife puts it). I purchase used go karts and mini bikes, fix them up, let my kids ride them for a while, then sell them. Its always fun to peruse Craigslist in search of my next project. A few more years went by, then the hobby turned into something more. 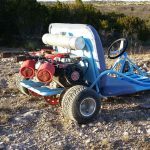 I joined DIYGoKarts.com, a forum where like minded go kart people are able to support the addiction by making some wheeled craziness, (e.g. bar-stool racers, mini-jeeps, minibikes, dual engine karts) or just answer questions about general maintenance and repair of a go kart. I have contributed to the madness there almost daily, and made a modified Manco Dingo kart that I like to call MIDAS. It has a touch of gold, polished diamond plate, and an engine that is 3 times larger than the original. This thing pops wheelies like nobody’s business and its FAST. Its not safe, but it sure is fun! Right now, I’m cooking up my next go kart video, maintenance tip, and have written up free go kart plans. Subscribe to me on YouTube (below) for some entertaining go kart videos, and follow me on your social media of choice for behind the scenes content of my next project. Thanks for visiting kartfab.com! If you want to help contribute to this website, and my build projects, you can become one of my build supporters. Click the donation option that you want, then click subscribe to keep my youtube, go kart builds, and website updates coming! Do you know of any high horsepower (15+) f-n-r transmissions available? I’ve heard about the comet fnr but I can’t find it for sale anywhere. I’ve also heard about people using Polaris transmissions. Is that the best option? Hello KartFab. Just bought the plans. Thank you for this work you have done. It makes starting so much easier. It looks like you have quite a bit of your design in CAD of some sort. Do you by chance have a AutoCAD file of the plate cut parts to scale? I plan to use a plasma cutting table to cut these parts. Would 1/4″ plate work or should I stick to 3/16″? Unfortunately I do not have any autocad files. PDF is as good as its going to get. 1/4″ plate is fine, but will add more weight. Hi, I purchased a pedal go kart from Amazon for my son for Christmas. It’s a little small so he’s working really hard to pedal. Can you help me out with the best way to extend the tubing so he has a little more leg room. I read so far to cut the tubing and install a few inches with welding. If you could do a video it would be greatly appreciated. I would also like to preplace the plastic-like tires if possible. Hello i am building a monster go cart. I have the 420cc predator with the 40 series torque converter. Anyways all i have left is the live axle and the seat. I saw your video and the 3 go carts you finished up for sale and i was wondering if you would be able to do seats like that for mine and i could buy them. I have no idea what kind of go cart i have as ive searched for months. Its a 2 seater. I already have the seat frame and sliders all i need is the cushions. I am unable to sew so it would be difficult for me to try it on my own. The seat dimensions are 33×17 for the bottom and 33×15 for the backrest. I havent found any online with those dimensions. If this is something you could possibly do for me please let me know. Thank you. Hi,im building a go kart,i bought a 212cc predator motor,its a single wheel drive,my sprocket is bolted to wheel,no jack shaft so,would the motor have to be mountes in driver side,or passenger side? Hi – just bought the deluxe plans and saw the steel bill calls for 5 x 10 foot sections of the 1×1 square tubing. I can’t see any sections of the frame that are 10 feet long so was this just the suggested length to get the most material out of the purchased sections? In other words, could I buy 6 foot sections even if that means I might end up with more waste cuts? My local steel supplier charges a lot for prep/cuts so I’m thinking it might just be easier to buy from my local HD/Lowes. your local steel supplier is going to be way cheaper than your local hardware store. They typically sell them in 20-22 ft sections. Do a little bit of math, and I’m sure you can get them in smaller legnths. I just bought the 20 foot sections and had them cut them in half, so its not really necessary to have them in exact 10 ft lengths if you can get everything to fit just right. its worth whatever someone is willing to pay for it. I sold mine completely restored with a new engine, chain, seat, paint job, and floor runner for $500. I also bought it for $100, so $100-$500 depending on condition in my opinion. Might be able to get more if its right before christmas and you got a lazy parent that waited until the last minute for gifts. I bought the deluxe plans and I was looking through it and couldn’t find the thickness of the metal used. What is the thickness of the plate steel? the plate is 3/16″ IIRC, it is right in the plans there just got to read them. It is in the first few pages that is the bill of materials. Hi im really intrested in starting my simple build but what’s scaring me a lirtle is cutting out my steel pieces from the sheet metal and since its my first time really the description by them are confusing. I know in total is 15pieces but since we’re using the 8″ seat whats the cuts needed now please help or i wont take the risk. thanks for the inquiry, i got your message on facebook as well and sent you detailed jpeg images of where to cut. If you are not comfortable cutting steel, you can just ask a steel distributor or machine shop to cut out the parts given the jpegs i sent you. They have laser cutters and water cutters that will make quick work fo it all if you just give them that diagram. Hello, I just bought the deluxe live axle plans/kit. Looking at the hardware, I had a question. The 5/8 machine bushing. Is that ID/OD? What thickness? Also the 2.5″ OD flat washer, what ID? Ray, the machine bushing is 5/8″ ID. it is just a very thin washer that is used to keep the nut from contacting the bearing seal. The other washer is for the steering wheel. If you go to the hardware store and get a fender washer, that should be good. the washer is for the steering wheel to attach to, so you could even just cut out a piece of metal and do it. Ok I am SFC STEVE RUIZ and I’m stationed in lubbock tx in the US ARMY. I am helping my son build a go cart. I am planning on buying that 212hp predator engine from harbor freight. I cannot find anywhere the stage one kit that you showed on utube. I can only find the ones with the timing plate advance. I only want the one that has the muffler, air intake system and carb jet. Can you help? hi I just bought the deluxe plan. 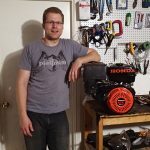 can I use the predator 212cc motor with the deluxe plan? Hi. I am thinking about removing the governor on my predator 212 engine and it seems fairly simple. However, the part I find confusing is setting up a throttle linkage since you remove the original throttle setup. I would greatly appreciate it if you could make a video, and or just explain to me how this is done. Yeah, I can do that. There are multiple ways of doing it. One way is to remove your gas tank, and install a top plate where the tank was. These are pre-fabricated and for go kart racing. Another way is to shave part of the black plastic off of the throttle mechanism and get a relatively inexpensive direct throttle linkage and do it that way. I was wondering if you knew somewhere to find “adult sized” go-kart plans. I’m 6’4″ so if I restore one or build one from most plans…. my knees are over the steering wheel and turning is awkward. Hi KartFab. Im new to the go cart world. I want to build a go cart, but I only have a lawn mover engine with 6hp. Is it possible to use it and how can I do that? 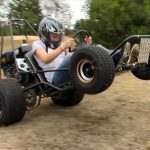 it is extremely difficult to make a go kart from a lawn mower engine because lawn mower engines are vertical shaft, and go karts use horizontal shaft. You would be better off finding an old industrial piece of equipment with a horizontal shaft engine on it (e.g. trash pump, wood chipper, power washer, edger, tiller) and repurpose the engine for a go kart. 1.Do the Live axle plans come with the upgrade kit or purchased separately? 2. The live axle design of yours with a Predator 212 engine – would I be able to drive it around if I weigh in at 205 pounds? 3. I am 6′ – 3″ tall, am I too tall for your design? If yes, can the frame be stretched a few inches? 4.If the live axle design is driven on pavement – can the axle be damaged? If yes, can the 1/4″ key be removed on one of the wheels? 5. What is the delivery time for the upgrade kit? 2)yes, easily. I weigh 230 and it hauls me around fine. Use torque converter for best acceleration and slightly higher top speed. 3) I am also 6’3″. Stretch frame between the steering hoop and pedals. 6″ stretch is about right. However, I ride the kart at the shorter length with no issues. 4) The live axle design is very robust. There is no way the axle will be damaged. It is just slightly harder to turn a very tight circle on pavement. With that said, this kart is easy to turn on pavement. 5) delivery time depends on where you live, usually 3-5 business days is when they arrive (dont quote me on that). Kits are typically shipped within 24 hours of ordering. might want to take it to a small engine shop for that. Alternatively, you can post your question on http://www.diygokarts.com They have a forum there and you can post pictures with questions and lots of people that are experienced can chime in. I am SUPER new to the go kart world. I never had one andi never built one. How long does it take you to build a basic one wheel drive cart shown in your videos? I want to know how long it takes you because i’m trying to gauge how long it’ll take ME if I work on it with my husband for a couple of hours each day. if you get all your ducks in a row before hand, probably 1 day for cutting, 1 day for welding, 1 day for painting, and 1 day for assembly. Hi, my friend and I are young enthusiasts, new to the world of Go Karts and we have had little success trying to build our own from old lawn mowers, chainsaws, bed frames, chairs, wheel barrows and anything else we could repurpose or buy dirt cheap. Do you have any suggestions for the more financially strapped? Try a scrap yard, metal recycler, or junk yard. Always wanted a go-kart and finally picked one up from a neighbor. Only took me 49 years and it’s for my son who still has a few years before he can ride solo. It has a 5hp Tecumseh H30 in good condition, roll cage, 11x4x5 turf tires, and a centrifugal clutch but is slow to accelerate from a dead start. We’re on the edge of town in a neighborhood where many families have similar “toys” and ride the cul-de-sac streets. Would it be worth upgrading the clutch to a torque converter? My concern is the engine is so small but I’d like to be able to “get out of trouble” should that ever arise. Sorry for the length but I wanted you to know where I’m coming from. Thanks. you would be ok with a 30 series torque converter. Double check the engine shaft diameter. Smaller engines sometimes have 5/8″ shaft. Worst case scenario, you drop in a predator 212 and that may fix your issue to begin with. If I have a one wheel go kart how would I make it into a live axle? Also can I put a Duromax 18hp engine on the go kart and what would I have to change to put it on? Search “live axle kit” you will need to weld axle hangars on the frame for the bearing flangettes to bolt onto. You can put an 18 hp engine on a go kart, but thats a BIG engine with about 3x the power you need. You would need to put a 40 series torque converter on it to be able to hold up to the stress, and a beefy motor mount. Thanks for asking, but I only have PDF plans. G’day KartFab. I have purchased the live axle deluxe plans and well advanced with my project. While my kart is basically your design, there is a difference. I have a vertical shaft 190 cc mower motor with a belt drive to a 3 speed Peerless transmission. As a mower motor the speed is controlled by a governor. My question to you is, when I set up a setup throttle control, would you recommend leaving the governor in place or run with throttle only? Really enjoying working with your plans. Cheers. John. steering hoop in subsequent kits was made longer. Cut the hoop to your desired length and angle so you have the steering shaft at whatever height you prefer. You turn the wheel opposite direction you want to go … What have I done wrong. Please help ! Would flipping the whole rack over help. I can’t have her drive it this way. Works great .. Only steering reversed ! Oh that is funny and tragic! You can also try switching the spindle arm location (e.g. flip spindle, if arm was facing toward rear of kart, flip so spindle arm faces front of kart). 1″ bore centrifugal clutch, or 40 series bolt on torque converter. No other changes needed if going with the deluxe live axle kit. Have fun! The U-shaped steering column support tube in the parts kit…Does that have to get mounted vertically or is there enough length on the legs to allow it to sit back at a 75 degree angle or so? it comes in the kit ‘long’ meaning you cut it to size. There are no hard and fast rules on where to mount it, and you can definitely allow it to sit back. If you put it on an angle, you should probably just weld another section of 1″x1″ square tubing for it to sit on so it wont flex. Have fun! You would know if you actually looked at the plans https://kartfab.com/go-kart-plans, just click on the free plan download and read the PDF. Yeah it will handle that. You might want to put some wheelie bars on it though as that is a lot of torque at the wheels. Really great package of info, tips, photos and videos you have here. A whole lot of “instructions” and YouTube videos get pretty vague at points ( “…wait…what the heck? How did he do that part? ?”) but you keep the novice on track. It’s a tough thing for an expert to remember all the way back to when they were a beginner and remember to convey the basics all along the process. Although I rode a lot as a kid, this is my first build and I’m doing it with my ten year old son. It feels really awesome to be able to share this with him. Although my dad was an awesome father, this stuff was not in his wheelhouse. he supported my karting but couldn’t really participate too much. I can see you are using Sketchup for design and plans. One of the bugaboos with SU is dimensions are pretty darned wonky right within sketchup itself. There are some tricks that I’d be happy to share if you’re interested. (I work on sketchup for a living and I love it!) Hit me on my email. do you sell plans for the Conquest model that is in this video? That is a manco/fox conquest that was built by a company. G’day KartFab. Love your website. I plan to build a go kart for still young grandsons. We are on a couple of acres so ideal for your live axle design. I plan to buy your plans for $US20. We live about 40K west of Melbourne so will be purchasing using $A. Is there any isuue with that? John, ts all done through paypal, so I don’t think that will be an issue. I have an old chassis that has been under appreciated for too long now. I would like it see go to a new home and brought back to life for someone to enjoy. I live in the San Francisco Bay Area. If you don’t mind my asking, where are you generally located, and would you be interested in starting a new project? First, thanks for all your videos and instructions — all very interesting, helpful and well done! I have a couple questions. I downloaded the free fixed axle plans, bought the steel that was listed in the plans to build the frame, and then bought the Standard Live Axle kit from GoPowerSports. I then went back to your site and paid for the Standard Live Axle plans, which I also downloaded. 1. I did not see in your LiveAxle instructions a list of the steel (only the hardware). As I examine all the diagrams, it seems to be basically the same as in the free fixed axle plans, except the LiveAxle diagrams also include a 3/16″ – 1″ flat bar that is used both under the motor mount and to support the steering hoop. Can you confirm if this is the only additional piece of steel needed or am I missing something? (and was there a list of steel in the LiveAxle instructions which I somehow missed?). 2. I see on your site there is a MyAccount link but I did not get a password with my purchase confirmation. Should I have gotten a password? Other than the link to the LiveAxle instructions and the XXXXXXX password to enter the site, was I supposed to get an account for some other info available? 1) live axle instructions have a list of the steel, it is on the 4th page highlighted in light red. Please reference that for what steel you need. 2) You did get a password with your purchase confirmation. You just posted it to the world so I edited your reply to avoid giving it out to the internet. You received an email that is your purchase receipt/purchase confirmation with the web address and password for both the deluxe live axle, and the standard live axle versions of the plans. 3) there are the plans that you have downloaded, then there are the webpages (1 for deluxe, 1 for standard) that you have the passwords to that have full size images of the same images you have in yoru PDF files in case you need to look at extra fine details. To answer your question about the standard live axle plans, no, they are not the same as the free plans. Similiar? Yes, but the motor mount, brakes, axle weldment positions, steering hoop, steering hoop brace, brake rod, and brake rod length are all different. Also, the parts for the free plans vs the standard live axle plan are different. If you want to know which one to build, please reference the plans of the one you want to build. If you want to know which parts you need, please reference the parts kit page for the parts you need to get. Hope that helps, and have fun with your build! Do you sell complete kart kits like the orange one you built or can you build me one an if so how much? the kits are on https://kartfab.com/go-kart-plans and you need to build the frame yourself, the rest of the parts are in the kit and are needed to attach to the frame. My 9 year old son and I would like to make a go-Kart out of wood. With Steering wheel. Can you recommend something for us. I do not have the proper tools for welding so wood is our best option. We would also like to have it as a 2-person go kart with a easy to bolt down pulley system motor in the back. Please help us with options. searching the web has not helped much. jeff, try youtube. There is a video series about how to make a go kart out of wood. Please understand that the reason why wood is not used is because it is not sturdy, it rots, and people have made them out of wood in the past only to have them break and seriously injure themselves. I was wondering it you do custom designs for steering systems? I was needing a heavy duty design for my custom BBQ Pit. it weights about 500 pounds and i need to add a way to manually turn the front tires so i can load it on to my toy hauler for competitions. Ughh sounds dangerous. Wish i could help. You are probably overthinking it. 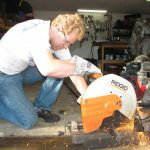 Might want to look into a floor jack, or even a motorized wheel that you can steer (like the ones they use for small airplanes or trailer movers). How much would the steel cost for the deluxe live axle frame? I wanted to get the deluxe live axle kit with a 420cc engine on it but I wanted to know how much all of the parts for the frame would generally cost if I went to a steel yard. depends on where you go, but IIRC $150 is what i paid for all steel and all hardware combined. Does your kit not come with all of the hardware? Just bought a 212cc Predator motor for my go kart.. got it all mounted and set up for the throttle. Problem I’m having is that when i start the motor the cam spins which makes the rear tire spin also.. What do i have to do so that its not spinning and just sits at idle so all i have to do is get on and go and not have to worry about the kart taking off every time i start it? adjust the throttle so the friction nut is loose (10mm nut that the throttle lever pivots on). Adjust it to idle with the black plastic screw on the top of the carb so it idles around 1600 rpm. This is below the clutch engagement rpm so it will idle just fine. My kids have downloaded your free go kart plans and purchased your kit. I’m giving them guidance on how to set thing up. They have followed your instructions and video. They are 95% complete. The instructions and videos are excellent. We have watched your video on installing the brake band and brakes. They are having troubles with setting up the tension on the brake band and braking. It seems it is a delicate balance between friction on the back tire and braking. On the bench, the tire stops when you press the brake. When the go kart is mock up with the tires on the ground, it does not stop very well when we push it. Can you give us guidance on how much pressure on the break band vs friction on the tire. The travel on the brake pressure is about 1/2″ because of the brake stops. Our concern is when you have the motor running and you can’t stop. The travel on the stops limits the braking power. Can you recommend how we will fix this. If the travel is 1/2″, then you didn’t install the pedal stops far enough away from the pedal. When installing the brake band stud you want to compress the brake band all the way around the drum, then that is the spot for the stud to be welded (with brake band compressed). The rod/pedal should hold the brake band away from the drum just far enough to where it doesn’t rub on the drum. Hope that helps! The drum on the kart I built locks up at any speed if you mash on the brake hard enough, and this is with the pedal pushed in approximately half way without the steering stops being an issue. HI there, I’ve got a vintage 60-70’s manco go kart, I was wondering if you can tell me what model it is if I send ya a few photos. you can contact me here, or on facebook, instagram, or anythign else but my phone. I do not give out my cell. On the Preadator 212, is it necessary to completely remove the governor? I removed the linkage rod and springs from the governor and fabricated a linkage to get full throttle. Something tells me you already know what you need to do, and you are just trying to find an easy way out. The engine is only $100 anyway, and gambling is fun. Need some help. Your video on drive and driven clutch overhaul was great. I have rebuilt the clutch/torque converter and have a question. The belt surfaces on the clutch were pretty pitted, wire wheeled them and all the rust is removed, they are shiny but still pitted, not smooth. I am not sure if polishing is going to solve the problem. Is the pitting even a problem? I guess that is my question. How smooth do you get it and how. You can only go so far when fixing these up. There isn’t much you can do for pitting short of replacing it. If it runs great with the pitting and it isn’t rusted, then I’d call that a success. Hi, I really enjoy this!!!! I always wanted a kart as a kid. 59 now…… and finally have one. Would like to fix it up and would like to know where to find parts. 920- 203-2170. Thank you! Tony. head on over to diygokarts.com and post a pic of your go kart on the member forum and ask. I was interested in the paid plans, however the form is not submitted via SSL. I’m not comfortable filling out that level of detail and sending it via HTTP is there another way? Peter, i dont have any cam grinding equipment. However, you can checkout small engine cams, dynocams etc these people can do that for you. I am looking to build a kart for my son. We are looking for something that is a little more off road orientated? Do you have any plans or suggestions for building this? Any info is very much appreciated! What is the weight limit on the standard live axle kart? What size person fits? No weight limit. Just two person. One adult and a small child or two young teens. how long did it take for you to make the go kart, also, do I need the live axle plans in order to build a live axle go kart? yep, and not too long. Depends on your skill level. Thank You. One more question. When using the 11″ seat slides and the bigger 12″ slider braces. What position do you weld the braces at? Do you keep the 1″ 10 1/2″ measurement from the front of the cart to the front of the brace or do you move the brace forward forward? It depends on where you want the seat to be when you are done there is wiggle room there both forward and rearward. Its up to you. I recently purchased the live axle plans and would like to build the standard frame with the torque converter, disk brakes and slick tires. Will the standard frame support these options or is the deluxe frame rear offset necessary to accommodate these parts? I’m essentially looking to build the deluxe model without having to use 18″ rear tires. Thanks! Offset not nevessary ground clearance may be an issue . I bought the live axle plans, im at the bearing and live axle installation part, im assembling the live acle so i can get my brake system set up correct. I have the 4 flangettes, the bearing, the 4 split collar locks, and the 2 rigid twist collar locks, im able to tell that the twist locks have a recess in them to fit onto the lip on the bearing. My question is the orientation of the flangettes, and orientation of the bearings. Do the flangettes face lip out or lip in? And does the lip side of bearing face inward facing motor, or outwards facing tire? James, orientation of bearings and lock collars doesn’t matter much as long as you have room for it to fit and you can lock them down. Flangettes have a lip on them that goes around the bearing, so the widest part of the flangette goes over the bearing, two flangettes per bearing. 5 or 8 will work, 8 is overkill but i did use grade 8. Manufacturers used grade 5 as an fyi so nothing wrong with that. hey…I switched computers and misplaced my downloads. any chance you can email me another link? the one I have says it’s no longer valid. Name email date purchased please so I can look up and resend. I purchased May 22, 2016 under the email address that this post is under. I’d prefer not to post it here so bots don’t pick up my info. Let me know if you can grab that from the posting. Albert, an old manco go kart would be a good place to start. Any idea when you might start selling complete go kart kits where everything just bolts together? I am set up to sell one, whats your zip code and I can give you a quote. website isn’t ready to sell stuff yet. My zip code is 95864. Need a go kart for my son. 13hp or more. I’d like it to do 40 or so mph with a roll cage. Can you build one for us? Like to be $1500 or under. Bryan. Please don’t take offense to this, but $1500 is not even going to cover the cost of materials. Try looking at a Trailmaster 300, and you will see that what you are wanting will cost between $3000 and $5000 built in china for less than what can be done in the US. Thanks. Would your plans for a go kart work for pretty much any simple go kart frame? the free plans are for a simple 1 wheel drive kart, and the paid plans are for a more advanced kart with better traction and off road capabilities. Hey…back in may I purchased the Live Axel plans, but only downloaded the Standard and not the Deluxe. I checked out the gallery area hoping a copy of the plans would also be there but was no so lucky. any chance I’d be able to confirm my transaction to get a download of the Deluxe plans? yep, i resent the purchase receipt to you that has both of the downloads on it. where do I get the brake rod and throttle cable guide tab and the eyelets..do I make them, buy it or does it come in the kit. You make them. Just need a drill and angle grinder. Hi – We are using a predator 212 which we modified with a straight exhaust and curved extended intake manifold in order to fit the engine inside the cart we are restoring. The governor is still on the engine. The engine is flooding and preventing it from starting. Any ideas if the flooding is related to the mods of the intake and exhaust? Did you rejet? High flow intake? fuel pump? choke on/off? bored out carb? Is your needle seating properly? I’m not a “Social Media” or “Computer” guy. Do you have a mechanism for me mailing a check for the plans and you sending them in the mail? All plans are emailed in PDF form. All you need to do is follow on screen instructions when buying them with a credit card and you will get an email with the plans in them. If you dont use a credit card, you can use paypal instead. Have you ever tried to incorporate your plans with a wood frame? Similar ones to what the gokartguru is doing. I would love to buy your plans, the parts from gopowersports and build the kart from wood using gokartguru. I just don’t have access to the metal frame. But would like to buy your frames. Brett, a wooden frame go kart is possible to build. However, my plans go over the best way to build a go kart. Wood rots, and can split easily. I’m not saying it cant be done, rather, that it is a very BAD idea to make a wooden go kart. A guy almost died when his fell apart (it was built pretty solid). If you lack the skills to build a metal one, rather than trying to make one out of wood, just get on Craigslist and buy an old one and fix it up. It may end up saving you from a serious injury or death. you can buy an intake adaptor and use a 22 mm mikuni carb, and they sell prefabricated exhausts (try torque tubes) or just google briggs 5 hp performance exhaust. yes, shipping is calculated upon checkout fedex international. Do you know where to find a 16 ga sheet metal (26″x20″ section)? I’ve looked for quite a while,and I’m having trouble finding the exact measurements listed. Mattie, google “steel suppliers near me” and just call them up, say you need to get a piece of 26×20″ 16 ga sheet metal sheared and order the rest of your tubing and plate while you are at it. i replied to you via email. Ill put a reminder on my calendar to respond to you tonight when I have access to a computer. Youtube videos area already up for the majority of the build (similar to free plans), however, live axle build videos are currently being edited and should be out within the next 2 months. The plans are very detailed and will give you all the information you need to build the kart – the special access page and youtube videos are just supplemental info. Love the plans and videos. Roughly everything invested in the cart including engine and all, how much did you spend on the completed cart? I’d like to build one for my nephew. Great website and thanks for all the great information. I’m looking at building a motorized picnic table. The idea is to be able to drive from the rear. I would like to build it up from your plans. Looking to seat 4-6 adults and beverages. Not looking to be racing around, just enjoy it around the campground. Questions being. 1. Do you think the steel tube that you are using will be heavy enough to support my idea? 2. Will a 6.5hp be big enough? 3. What type of clutch would you recommend? Thank you for your time. Kevin, thats a great idea. You will need to gear it for a very very low speed so you don’t burn up the clutch. You will have to achieve this through compound reduction through jack-shafts. Id say the engine and clutch are not as important as your gearing. Gearing is the key to the entire thing. Would you just build me a two seater frame like the one in th videos? I don’t have the stuff to build one. I can’t find one anywhere. I would like to buy one and then get the go power kit and put it together. I do not build go karts for people. Sorry. I just bought my first kart to work on with my kids. It’s an old two seat kart with a 6hp Tecumsuh (tecumseh engine 0HH60 71157D) that isn’t running and a bolt on roll cage. From what I have read I should just take that engine off and replace it with a predator 6.5hp. Is that something a novice can do fairly easily with the help of your videos? The steering wheel shaft is also rusted to the guide tube. Any tips on breaking that loose? Thanks. yeah, the bolt pattern for a predator and tecumseh are the same. you just unbolt it, and bolt on a new one. The steering wheel shaft would need some ‘pb blaster rust penetrating spray’ or similar spray to lube it up, then just work it back and forth until it gets loose. Great site. Can you tell me if you can point me to someone who may have built a utility vehicle? Possible plans? Hi. I am reading through your deluxe plans. I was wondering what the kart can top out at with the 6.5hp Predator engine? I was thinking of building a kart to your specs but using a larger engine and 40 series torque converter. What are your thoughts? The 6.5 hp engine with 30 series torque converter tops out at 36 mph, which is pretty fast for a go kart. What you are talking about for the 40 series is possible, I have done it to a few old go karts. The torque that they have is unsafe for a go kart, and I do not advise doing this (especially if you are wanting to put kids on the kart-see my YouTube video “go kart wheelies”). Safety is a huge deal with go karts as they are basically a small car with no safety features. With that being said. If you were to choose a larger engine and 40 series torque converter, the engine mount that comes in the deluxe kit is designed for the small AND big block engines (eg 8-22 hp size 4 stroke industrial predator 420 cc, honda gx390 etc). 2) build your own jackshaft setup. I have built my own jackshaft holders using DOM tubing or pipe with an ID just over 1 3/8″ and put in a 5/8″ keyed shaft and bearings for the jackshaft to hold the driven unit. Then you would need to weld it to a second plate that keeps the center to center distance fixed. The holder and plate would be one unit, the engine would bolt through that unit and the supplied mount in the kit. So…. With all that said… I don’t advise putting in a large engine as the way I designed it is safe and still very powerful. Thanks for the question. Basically you get two plans, the standard live axle and the deluxe upgrade. Each plan has a support page. Within the plans themselves, you scroll down to the 3rd page where it says “Password protected area of KartFab.com for extra support and pictures ” and you will find a link below that and the password below the link. The password protected area is a supplement to the plans and has many of the same pictures in the plans, but in high resolution. It’s fine if that’s the way it come. If you bought bolts that are too long, you can always get shorter ones. The bolts are welded to the seat slider, I cannot replace them. I thought you may have seen this before on karts you’ve refurbished and sold? You don’t need to replace the bolts that came with the slider. Hey Man great videos! what is the average coast for the steel materials and cost of hardware? i can t seem to find a steel shop around me. CJ, the steel will run you about $150 at most. The hardware will be about $30. I got all mine at tractor supply and they sell it by the pound. Try searching in google for ‘steel distributors near me’ or ‘steel yards near me’ some metal recyclers buy used/extra steel and sell it at a discount. Im lucky enough to live in dallas where any steel yard wil ship me steel for $30 + cost of materials. Wow man so talented . I only wish I could do what you do . I can’t seem to find on your website where you guys work out of. I am not looking for custom built small engine motor for a go kart but for something else all together. I feel you have the skills to take what I have in my head and make it real. Anyways man you guys are awesome ! Hmm sounds like a waste of power, but if you do want a good clutch, I have heard that the Noram clutches are good. Do you have instructions on how to align a go kart jackshaft? I moved mine over to replace the torque converter and now the jackshaft sprocket is a little too close to the engine and out of alignment. You can use machine washers to fine tune alignment left and right. Also, you can ‘eyeball’ the jackshaft with the axle shaft to make sure they are parallel. Sometimes pictures are needed, so check out the forum at DIYGoKarts.com and post pics. Lots of people can help over there. I moved the shaft to the left and to the right, but every time I tighten the driven pulley, the sprocket wants to push against the engine for some reason. Took your advice and put a washer behind the jackshaft sprocket. Everything lined up just right and I was able to use the kart with no issues afterward. How does the Manco double seat stay latched on one side? I just installed a new seat and slider latch assembly on my kart, but one side just floats around. It just floats. That’s the way it is. No, I already sold it.